What happens when a group of talented kids from a performing arts school are faced with an impossible challenge - create a showcase in only two weeks that shows the world how they were created to shine? - April 22 only. From the creative minds of award-winning Bethel Music, comes this high energy and heartfelt story by writer/directors Fred Vassallo and David Noroña, that combines incredible dance with powerful songs to reveal even kids can change the world, when they find their voice and tell their story. 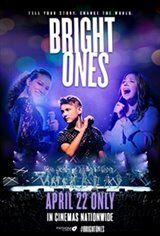 Bright Ones is an uplifting and moving film that will inspire the whole family.